A brilliant bottling of Benromach! 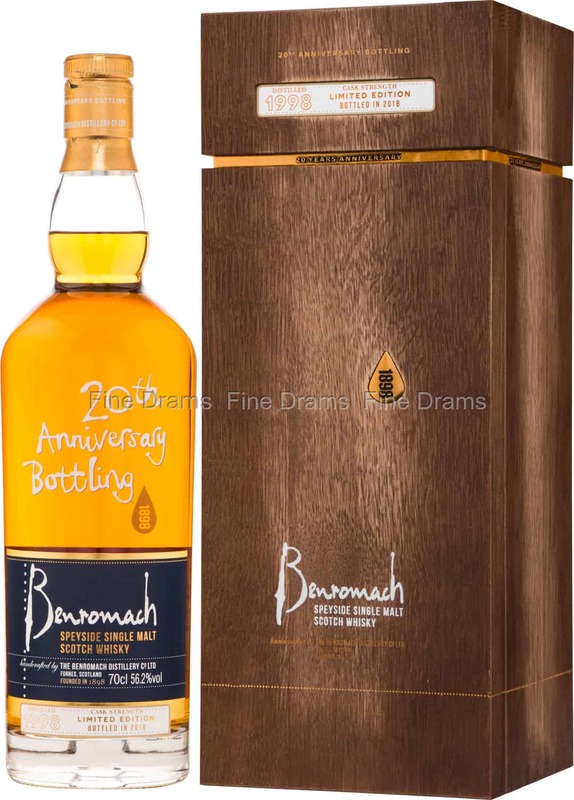 This very limited edition whisky was bottled to mark 20 year since the distillery was revived in 1998- the second time Benromach had been resurrected. The whisky was matured in first-fill oak casks for 20 years, meaning it contains spirit from the first distilling year after the distillery’s reopening. This long maturation has produced a wonderful depth and complexity in this dram. The result is a Benromach of a rare quality, rich with notes of citrus rind, dark berries, warming nutmeg and cinnamon, stewed raisins, ginger, chocolate, vanilla, liquorice, black tea, juicy pears and some slight honeyed melon. A delightful whisky, bottled at a full cask strength of 56.2% ABV, and without chill-filtration or artificial colouration. A fitting tribute to the return of one of Speyside’s finest distilleries. This whisky was limited to just 3,000 bottles worldwide.